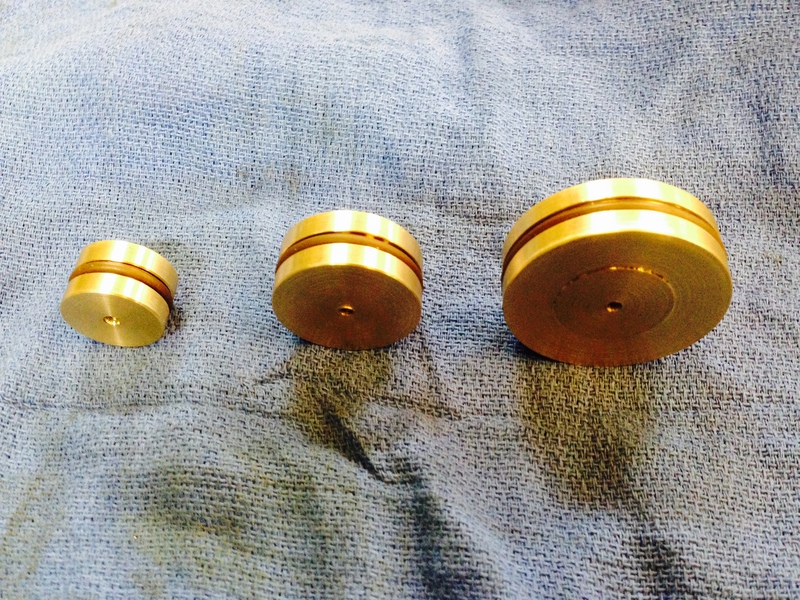 Pistons for triple expansion steam engine. Yesterday I turned the pistons for the steam engine. The plans called for the pistons to be made in 2 halves, and the rings to be cast iron. But the plans also showed the cylinders were cast iron, and my castings were all gunmetal. So with gunmetal cylinders, I decided that iron rings were not appropriate. I have used graphite impregnated packing for other steam engines, but after investigating the use of Viton O rings, I have decided to use them. Viton rings are easy to install, cheap, easy to replace, and apparently work well. They would not be used in an engine doing serious work, but my steam engines are more for display and interest and education, and will do few hours under steam. Also Viton rings are quite small. So if I decide later on that I want to change the Viton to packing or something else, I will simply turn larger grooves in the pistons to accept the alternative. The pistons with Viton rings .